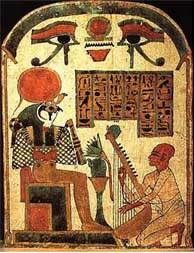 Ra (pronounced Rah) is an ancient Egyptian sun god. The meaning of his name is uncertain, but it is believed that if it is not a word for ‘sun’ then it could be a variant of ‘creative’. He is associated with the Falcon, the symbol of other sun deities who protected the pharaohs in later myths. Ra changed greatly over time in one form or another. Ra was merged with the god Horus in prominent and powerful Egyptian times. Once his worship reached this level of importance, he was then believed to command the sky, the earth, and the underworld. After deities were paired, pharaohs, the children of Hathor were considered to be fathered by Ra. As his cult arose in the Egyptian pantheon, Rah often replaced Atum as the father, grandfather, and great-grandfather of the deities of the Ennead, and became a creator of the world. There is question amongst the Egyptologists as to whether the Heliopolis priesthood placed their local sun-god, Ra, above all other deities such as Osiris. Rather, it appears that the Great Ennead (meaning nine deities of Atum, Geb, Isis, Nut, Osiris, Nephthys, Seth, Shu, and Tefnut) appeared during the decline of Ra’s cult in the sixth dynasty and after the introduction of the new pesedjet. Ra saw a resurgence until Horus gained prominence. Worship then focused on Ra-harakhty (meaning Ra, who is Horus of the Two Horizons). As a visual expression of Ra, a wall was built to the city of Cairo with blocks from the Temple of Annu after an attempt to lessen the influence of the temple of Atum. The cult of the Mnevis bull, an embodiment of Ra, had its centre here and established a formal burial ground for the sacrificed bulls north of the city.